A wall of floor-to-ceiling windows allows light to beautifully stream into the living room. This white, buttery soft leather sofa is the focal point of the living room, framed by the wall-to-wall windows. An Eames-style nesting chair is the ultimate in luxury and comfort. The light-filled dining nook features an architectural table, leather chair and custom painting by Martin Cervantez. We love working with local artists and this piece by Martin Cervantez is one of our all time favorites. The master bedroom. Sink into the handmade mattress every night and enjoy the luxe sheets, as you rest better than ever. The bedroom is a sacred place for most and we at Dwel take it very seriously, selecting everything from the mattress to the lamps to the artwork with comfort, luxury and rest in mind. For those mornings when you want to stay in bed, enjoy the SmartTV in the master bedroom. The master bathroom. Each Dwel apartment has plush white towels, worthy of a 5 hotel. The vanity has plenty of space for trinkets & beauty products. A spacious bathroom leaves one feeling calm and collected. The deep tub in the master bathroom is perfect for a relaxing evening soak. Spacious walk-in closet in the master bedroom, definitely needed when living in Tysons The second bedroom - full of light thanks to the floor-to-ceiling windows. Standing shower in the second full bathroom. Vanity & mirror in the second full bathroom. Gather friends on the bar stools, or grab a quick breakfast before heading to work. This apartment is all about catering to your needs and lifestyle. Step from the living room right onto your very own wraparound balcony Imagine early mornings on the balcony, watching the sun rise with a mug of coffee in hand, before the rest of the world is awake. This huge L-shaped desk right next to the kitchen offers plenty of organizational space and is perfect for a late night of work. All Dwel apartments feature hi-speed Wi-fi you can rely on. As Tysons Corner’s first luxury high rise, Ovation at Park Crest is a true gem boasting resort style amenities and world class service. As the preferred furnished accommodations provider, Dwel offers a mix of well-appointed 1 and 2 bedroom furnished apartment residences – each one unique in its own way. We are pleased to present this truly special 2 bedroom 2 bath luxury penthouse residence located on the 18th floor of Ovation. 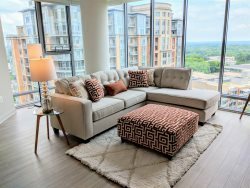 Entitled "Luminous" after the original piece of artwork in the dining area by artist Martin Cervantez, this apartment offers guests outstanding view of Tysons and plenty of natural light. The custom furniture package makes this space a great mix of style and function. Complimentary black car airport pick-up is included.